This illegal alien drove drunk on Christmas Eve of 2015, and crashed into another car, killing the 14 year old daughter of a local pastor. That’s not the worst of it. Efrain Lopez-Contreras was deported in 2010 for drunken driving and resisting arrest. Had we had a border wall and border security, 14 year old Giana Bartolucci would be alive today. Drunk illegal alien kills 14 year old girl. Her death not only belongs to this criminal alien, but to those who support illegal immigration. 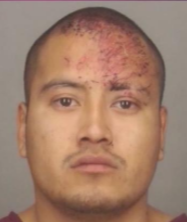 Efrain Lopez-Contreras, an illegal alien, pleaded guilty to driving drunk when he crossed the centerline on Redman Road and hit a vehicle head-on, driven by Clarkson Pastor Tony Bartolucci. Bartolucci and his daughter Giana were trapped in their car when it caught fire. They were pulled out by Good Samaritans. The pastor recovered but his daughter died months later. During sentencing, the judge pointed to another incident in 2010 when Contreras was deported for driving drunk and resisting arrest. She said Contreras made mistake after mistake, and will now be held accountable. Read more….